Q&A with Kelly Smith – Arsenal Ladies, England & Team GB Footballer. Kelly, is currently in her third spell with FA WSL club Arsenal Ladies. As a teenager she played in the US college system, Kelly broke records with Seton Hall University then played professionally with Women’s United Soccer Association (WUSA) franchise Philadelphia Charge. After returning to Arsenal for a spell which included a 2007 UEFA Women’s Cup win, Kelly went back to the US with another professional contract, with Boston Breakers in the Women’s Professional Soccer (WPS). She has accumulated over 100 caps for the England women’s national football team since making her debut in 1995. She is England’s record goal scorer with 45 goals. 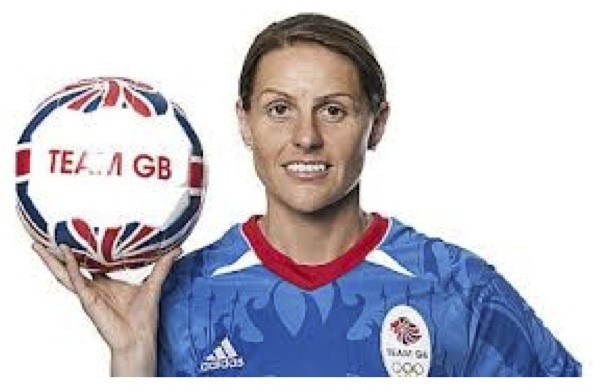 She played for Team Great Britain at the 2012 London Olympics. Kelly has recently brought out a book called: Footballer, My story. Footballer: My Story is the inspirational tale of a woman with a drive to succeed despite all the obstacles thrown in her way. It is the unique inside story of a star in a sport enjoyed by millions yet often not granted the recognition it deserves. And as she nears the end of a glittering playing career, it is the story of how Kelly Smith became what she always wanted to be. A professional footballer, in a professional league. Here is a link to buy Kelly’s book on Amazon. 1/ Growing up who was your role model as a player? And why? Ryan Giggs we played in the same position, he was left footed and so was I. I loved the way he ran with the ball and took defenders on. He was fast and skilful and I loved watching him play. I tried to model my game on him growing up. 2/ As a top player what advise do you have for younger players? You can have all the talent in the world but if you don’t work hard you will not succeed. Listen to your coaches and watch football at the highest level see what players do that play in your position. It is a great tool for your own development. 3/ What is the difference between the US women’s game to the English game? The speed of play is quicker in the USA. I believe due to the teams training together on a more regular basis. 4/ Do you think the WSL has been a success? Yes so far, the league is still young and developing. The games are alot more competitive which makes it more enjoyable to play in. Each year we want to raise the profile and see growth within the league. 5/ What can team GB learn from the Olympics? It was an amazing experience playing in the biggest sporting event in the world but it was a shame we couldn’t get to a medal match as we fell short to canada. We need to learn to win when the pressure is on even if it is ugly. 6/ How far away are England from winning the world cup? Well first off we have to qualify for the next one in Canada. We always set our stall out every campaign to qualify. England as a nation should be qualifying for major tournaments. There are so many top teams in Europe – Germany, Sweden and France to name a few and that is very hard in itself. The last world cup we got to the quarters and lost to France on penalties. You also have to have a little luck along the way, depth in your squad and a strong team bond to go all the way.